Made with real grated parmesan cheese, anchovies, garlic, soyabean oil and vinegar, just like the traditional recipe. Best Foods Caesar Dressing is made with real grated parmesan cheese to stay true to the authentic taste of this popular dressing. May contain traces of cereals containing gluten, soy, and peanut. 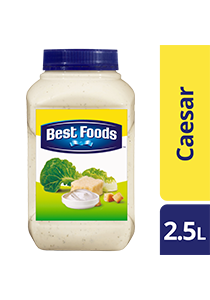 The classic flavour that everyone loves, Best Foods Caesar Dressing is loaded with real grated parmesan cheese and finished off with the hints of garlic, anchovies and spices that perfectly complement with your Caesar salad.